Return Of The Rudolph Video Slot Guide & Review - Casino Answers! Return of the Rudolph is a 5-reel, 50-line video slot developed by Realtime Gaming, featuring stacked wild symbols, expanding wilds, scatter wins, multipliers, three free spins features, a bonus game and a progressive jackpot. You can play the Return of the Rudolph Real-Series Video Slot at Bovada. You must play all 50 lines when you play the Return of the Rudolph slot machine. Total bets available are $0.50, $1, $1.50, $2, $2.50, $3, $3.50, $4, $4.50, $5, $12.50, $25, $50, $125 and $250. The least you can bet on the Return of the Rudolph online slot game is $0.50 per spin up to the maximum total bet of $250 per spin. The Return of the Rudolph progressive jackpot slot has a good betting range, suitable for casual players and high rollers. You can play the Return of the Rudolph online slot game by selecting your bet and pressing the “Spin” button. Return of the Rudolph is host to a progressive jackpot, which at the time of this writing was at $6,050 and ready to be won at any time. You can win the Return of the Rudolph Progressive Jackpot by landing 5 Scattered Thug symbols anywhere on the reels of Return of the Rudolph. The Rudolph symbol is the highest paying fixed payout on the Return of the Rudolph slot game and will pay out up to 2000 coins. The Rudolph symbol is wild and will substitute for all other symbols except for the Scattered Thugs. The Rudolph symbol is stacked on reel 3 and if it appears on all 3 positions, it will become an expanding wild as well as a 3X multiplier when substituting in a winning combination. When 3 or 4 Scattered Thug symbols appear on the reels of Return of the Rudolph, you will be able to select one of the symbols to activate 1 of 3 special features. You can win lots of money by triggering these features when you play this slot game at Bovada! 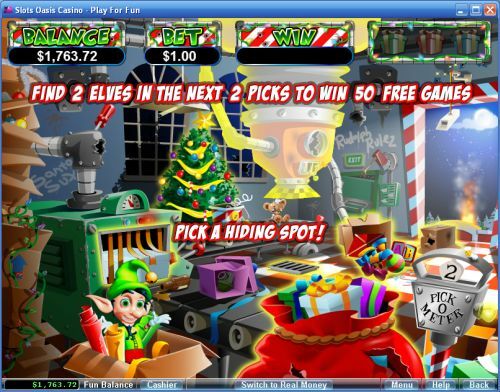 If you trigger the Santa Strikes Back feature, you will win 7 free spins with an initial 1X multiplier. The feature is similar to the one found on the Santa Strikes Back Video Slot. During the free spins feature, the Santa, Rudolph and Thugs symbols will have a Candy Cane symbol in the background. When a Candy Cane symbol appears on a reel, it will light the Star at the top of that reel. If you light all 5 Stars, you will reset the number of free spins to 7 and increase the multiplier by 1. Stars will remain lit until a reset occurs or the free spins feature ends. The feature can be reset up to 9 times. The progressive jackpot is not multiplied. Scatter symbols do not appear during the free spins feature. The progressive jackpot can be won, but cannot be multiplied. Free spins are played at the bet of the triggering spin. If you choose the Rudolph’s Revenge feature, you will also win 7 free spins. Prizes during each free spin are multiplied by 2X plus the number of Rudolph symbols appearing on the screen. Scattered Thugs act as additional Rudolph wild symbols if 4 scatters trigger the feature. 3 or 4 Scattered Thugs appearing during the feature will add 7 games to the feature. The progressive jackpot can be won during the Rudolph’s Revenge special feature, but cannot be multiplied. Free spins are played at the bet of the triggering spin. Wins on different paylines are added. Compulsory 50 line play per spin. Scatter wins are added to payline wins. Scatter wins are multiplied by the total bet, except for the progressive jackpot. Payline wins are multiplied by the bet per line. Highest win only on each payline. Maximum win per paid spin is 50,000X bet per line. Hit the “Autoplay” button to open the autoplay settings. You will be able to set the number of spins, set it to stop when the jackpot is won, stop if a win exceeds or equals (any amount you input), stop on any win, stop if your balance increases/decreases by any amount you input and stop once the feature is triggered. You can stop Return of the Rudolph’s autoplay mode using the “Stop Auto” button to deactivate it. 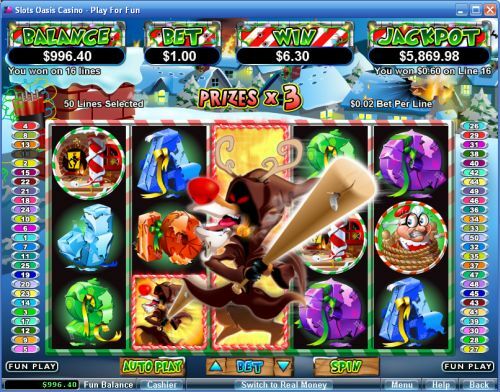 Return of the Rudolph is an amazing video slot no matter the time of year, so you can imagine how awesome it is during the Christmas season. It’s bursting at the seams with special features, a progressive jackpot and lots of different goodies that you can not only enjoy but can potentially increase your bankroll. Also take into account the first-class presentation RTG has treated this video slot with and the humourous theme that it has. We are really enjoying this evil Santa/Rudolph mini-series RTG has going, so we hope to see more. To play the Return of the Rudolph video slot for real money, sign up and make a deposit today at Bovada! Can players from the USA play the Rudolph’s Return video slot for real money? Yes, if you are located in the United States of America, you are welcome to play the Return of the Rudolph online slot game for real money. We recommend that you play this top-notch video slot at Bovada! You will win the Return of the Rudolph Progressive Jackpot if you land 5 Scattered Thugs symbols anywhere on the reels. If you only land 3 or 4 Thugs scatter symbols, you will instead trigger one of the three special features. How do I trigger the features on Return of the Rudolph? To trigger the free spins and bonus game features on the Return of the Rudolph video slot, you must land 3 or 4 scatter symbols on the reels. 5 scatter symbols will win you the progressive jackpot. Why isn’t the Rudolph symbol expanding? The Rudolph wild symbol only appears as a stacked wild symbol on the third reel. It will only expand when three symbols appear on that reel. When it does expand, it will act as a 3X multiplier and it will triple your prizes.